The ViewSonic PG603X projector features high resolution, an intuitive, user-friendly design and a sleek chassis. Exclusive SuperColor technology offers a wide color gamut for beautiful image production in nearly any environment, while SonicMode sound enhancement technology powers speaker for incredibly clear and audible sound. An energy-saving SuperEco feature reduces power consumption and extends the lamp life. With horizontal and vertical keystone correction, 4 corner adjustments, and extensive connectivity, this projector provides for flexible and quick set-ups, and is the ideal projector for use in education and business environments. ViewSonic’s proprietary SuperColor™ Technology features an exclusive 6-segment color wheel and dynamic lamp control capabilities, providing a wide color range and stunningly beautiful images. Packed with 3,600 lumens and a high contrast ratio, this projector produces bright images in nearly any environment. IT admin can monitor, schedule, and manage the projector remotely, as well as receive projector status alerts, with the integrated Crestron® e-Control™ system and RoomView Express™ management software. Because this projector is Crestron® and AMX® certified, IT admin can control and monitor the projector for any size campus or enterprise. Deliver your presentations using a quick, simple plug-and-play USB connection without running a bulky connection cable. Using the built-in USB reader you can display photos, Microsoft Office files, and PDFs, directly from a USB flash drive. With its advanced networking capability, this projector can project images via wireless, or wired, LAN. The LAN display offers a quad split screen for simultaneously projecting content from up to 4 PCs, with the ability to broadcast from up to 8 projectors. The PJ-WPD-200 wireless adapter (sold separately) is required for wireless display. 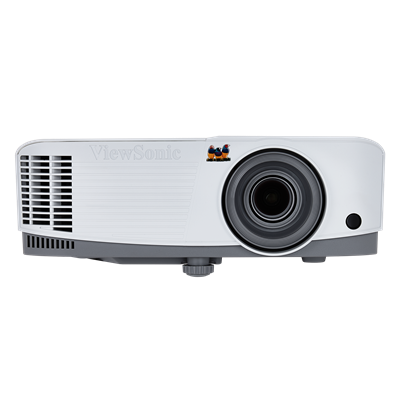 The ViewSonic® PG603X XGA networkable projector features 3,600 lumens, XGA 1024x768 native resolution, an intuitive, user-friendly design and a sleek white chassis. Exclusive SuperColor™ technology offers a wide color gamut for beautiful image production in nearly any environment, while SonicMode™ sound enhancement technology powers a 10W speaker for incredibly clear and audible sound. An energy-saving SuperEco® feature reduces power consumption and extends the lamp life by up to 15,000 hours. An integrated USB A reader port, and optional WiFi (PJ-WPD-200 wireless dongle sold separately) deliver flexible content streaming and wireless presentation options. Equipped with Crestron® LAN controller, this projector makes it easy for IT admin to remotely control and manage multiple projectors from their workstations. With horizontal and vertical keystone correction, 4 corner adjustments, and extensive connectivity, this projector provides for flexible and quick set-ups, and is the ideal projector for use in education and business environments. SuperEco™ mode allows users to dim projection brightness by up to 70%, thereby reducing the lamp's power consumption—a great energy-saving design that lowers the total cost of ownership (TCO). A choice of 5 unique view modes provide the best possible viewing experience in any environment regardless of ambient light. Designed with two HDMI ports, this projector is perfect for connecting to any HDMI-enabled device, and can display 3D images directly from 3D Blu-ray players. 3D images can be viewed with optional ViewSonic PGD-350 Shutter Glasses, or any other compatible 3D glasses. A programmable hotkey “MyButton” can be configured to launch the most commonly used functions. Control up to eight projectors in the same venue or from a mobile device via free V-remote app. ViewSonic offers one of the industry's best overall projector warranties with 3-year limited parts and labor, 1-year lamp, and first year free Express Exchange service* for an added value worth up to $150**. *One year Express Exchange Service requires product registration. **Up to $150 added value over competitive models with 1-year warranty and based on extended warranties from manufacturers and not third party warranty providers.